When you are building a home it is often quite possible to know in advance exactly which steps to take and in which order. You simply cannot start with the roof, continue with the walls and finish with the basement. You cannot apply the wall paper before the walls. Furthermore, you can easily predict how much time is required for applying X square meters of wall paper, or Y roof tiles etc. There are manuals available for project managers containing a wealth of data on standard work and its cost etc. In effect, it is possible for a competent construction project manager to create a plan for a project like this and to follow it with no small chance of success. In software engineering on the other hand, things are a lot more difficult to predict. You cannot know in advance how long it will take to implement requirement X. This is because you are not assembling house number 1000 in a long line of identical houses. The whole idea of software engineering is to take something which is more or less unknown and transform it into something well known. So while designing the software is not really a predictable process impressing it on a CD and shipping it is. 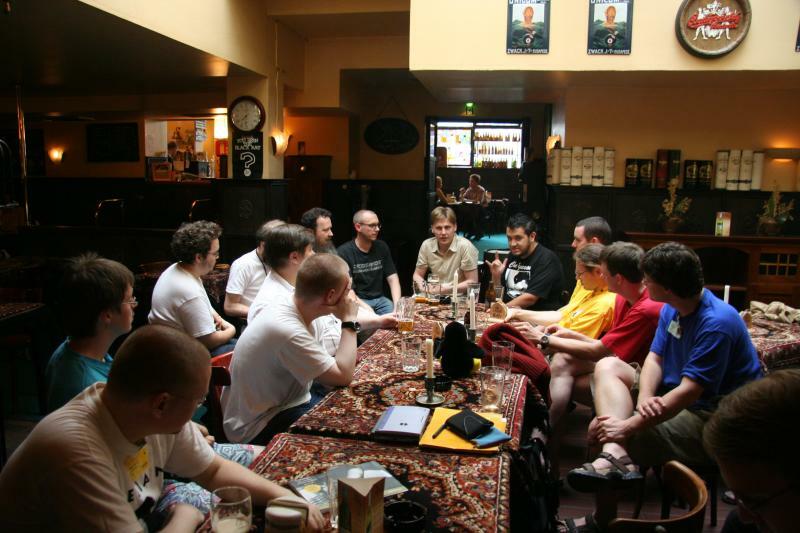 Meeting with Finnish Linux User Group people in WilliamK bar. Skills which are equally useful for a software engineer or manager! And that’s not all. With smart buildings the software component of the construction work is increasing. Intelligent building of intelligent buildings will be a new and major challenge for the construction industry. I guess I will soon have to switch to another example when I want to explain under which circumstances a non-agile project management style is most appropriate. agile, project management, software engineering management, waterfall. Bookmark. Interesting. I wrote about Agile construction earlier this week. Hey! That's a really interesting article you wrote there. What do you think about the surmise that construction project managers lack certain social skills to help make them more agile?